Beautiful custom made rings to commemorate a life dedicated to serving in the Armed Forces. 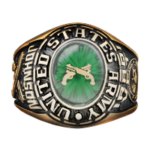 All rings can be personalized with the name of a soldier, sailor, airman or marine. Rings are available in Silver or Gold and priced to suit all budgets. 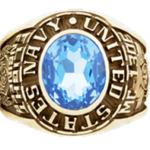 The rings are one of the most treasured items of jewelry for active and retired personnel. Custom Military Rings symbolizes courage, commitment and loyalty and are instantly recognizable. 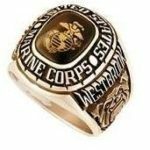 The current selection of rings are designed for the Army, the Air Force, the Navy, Marine Corps and Coast Guard. Military rings are a superb way to mark achievements such as promotions and combat awards. Our deployment rings honor men and women who are fighting to defeat the Global War on terrorism and making the world a safer place for the next generation. The military rings are unique jewelry worn by thousands of soldiers, sailors, airmen and Marines to celebrate the services and achievements. The military rings are a symbol of honor. The ring is given to show gratitude for the sacrifice that the men and women of the military give to ensure that our borders are safe. The ring is a sign of loyalty, courage, and symbol of dedication to duty. Balfour Military Rings can be designed to commemorate specific milestones and occasions. Balfour Marine Corps Rings for all the major divisions and overseas campaigns. Balfour Navy and Air Force Rings all available in Gold and Premium Silver. Free shipping on selected rings.